The very first patient that sat down in front of me had an abscess encircling the inner border of his eye that had been growing for a week. The child barely reacted as he listened to me explain what I needed to do to drain it. He sat bravely, barely making a sound, as I lanced the abscess with a needle and without lidocaine. He sat quietly as I continually expressed the fluid, and he was even quieter as we gave him two intramuscular injections of an antibiotic. When I finally told him we were finished, his face transformed into one that appeared overwhelmed, frightened, and quickly covered with tears. This 6-year-old boy had held it together because he knew he needed to, despite being terrified and in pain. Over my week in Haiti, we saw close to 500 children, all of whom had little to no access to health care and carried their illnesses with them for up to years at a time. Many came in for common things – abdominal pain, rash, fever – but others were fighting much harder battles. We diagnosed a case of typhoid fever, educated and referred children with severe malnutrition, and disclosed results of HIV and pregnancy to our young patients. We treated a teenager who had walked two miles on crutches for treatment of a partially necrotic leg wound from a motorcycle collision. Even the youngest of these patients stood courageously in the face of bloodwork, injections, wound cleansing, and life-altering results. 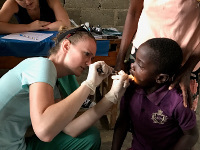 It is that brave look, the one I saw in my first patient and all the others to come, that will stay with me when I think about my time in Haiti.